Location: Below, and to E of pavilion which is about 100m E of park entrance at junction of Waterloo Road and Stow Park Road. Built 1910, by Thomas Mawson, landscape architect, also responsible for design of the park. Built from stone quarried in the construction of the park; the work was commissioned as unemployment relief. Grey-brown stone, with red terracotta balustrades and copings, ball finials. Series of terraces sloping downwards (roughly W) giving views over Usk and Bristol Channel. At the top, partially enclosing pavilion are 2 low walls (reduced in height to NW). Below entrance to pavilion, terrace divides forming 2 flights of stairs leading down to first of 2 narrow terraces approximately 3m below pavilion; beneath these stairs, 5 segmental arches with upper windows boarded over, curving stepped walls to ends of terrace. Lower narrow terrace separated by a grass slope (drop approx. 1.5m) with 2 flights of stairs (balustrades lost), at each end of this section, exits to park. A further 2 flights of stairs lead down (drop approx. 1m) to a large rectangular terrace with a low stone parapet and circular bastions in the 2 outer corners. This terrace has a rebuilt polygonal bandstand. From this level, central pair of stairs curves down, to unite as single stair curving wall. The bottom wall has 2 stepped buttresses, and the corner bastions are battered up to parapet level. 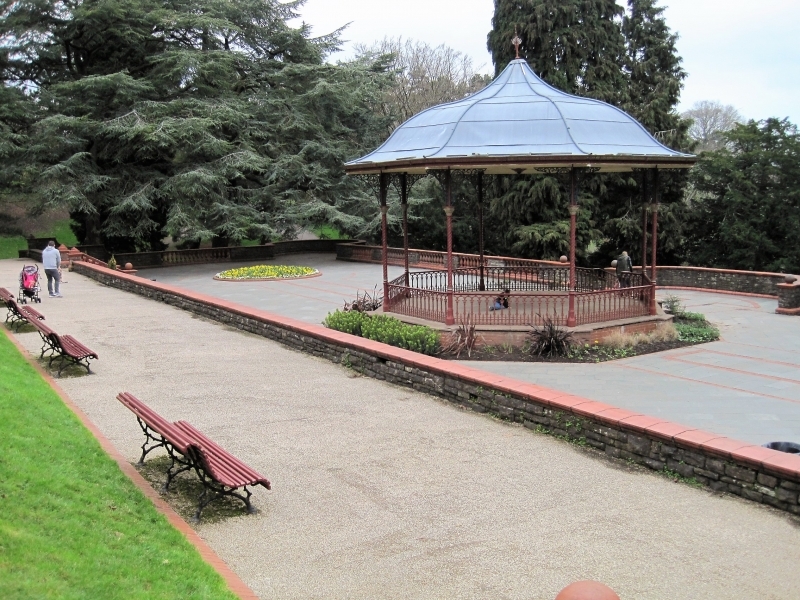 Listed as large scale terracing in Belle Vue Park conservation area, a Grade II entry in Register of Parks and Gardens of Special Historic Interest in Wales. Group value with adjacent pavilion. About 100m E of park entrance at junction of Waterloo Road and Stow Park Road. About 25m SW of main pavilion in Belle Vue Park. At NW entrance to Park, near junction of Waterloo Road, and Friars Road. At South (Cardiff Road) entrance to Bele Vue Park. At W end of Friars Road, set back behind gardens. On the S side of Cardiff Road (B4237), c60m SW from the Lodge to Belle Vue Park. Near W end of Friars Road, set back behind gardens; immediately to R of 1-6. At N (Friar's Road) entrance to Belle Vue Park.